In early January at CES 2016, Wireworld Cable Technology announced development of it’s new Starlight Category 8 Ethernet Cable, the first of it’s kind. Designed with new conductor geometry, it is vastly superior to Category 7 and was constructed to support high-speed transmission for the best reproduction quality music & video streaming. The Starlight Category 8 cable was designed to be flat which allows for it to provide better separation between the four conductor pairs, effectively providing lower cross-talk. The cable also is buffered with Wireworld’s Tite-Shield technology that wraps each conductor pair with a three-layer shield, assisting in isolating the four channels. Starlight is also able to minimize tribo-electric noise using Wireworld’s proprietary Composilex 2 insulation. Wireworld Cable Technology announces the development of its Starlight Category 8 cables for high speed media network applications. Unlike Category 7 cables, these innovative cables utilize a new conductor geometry developed by Wireworld to support higher transmission speed for the most lifelike reproduction of streamed music and video. 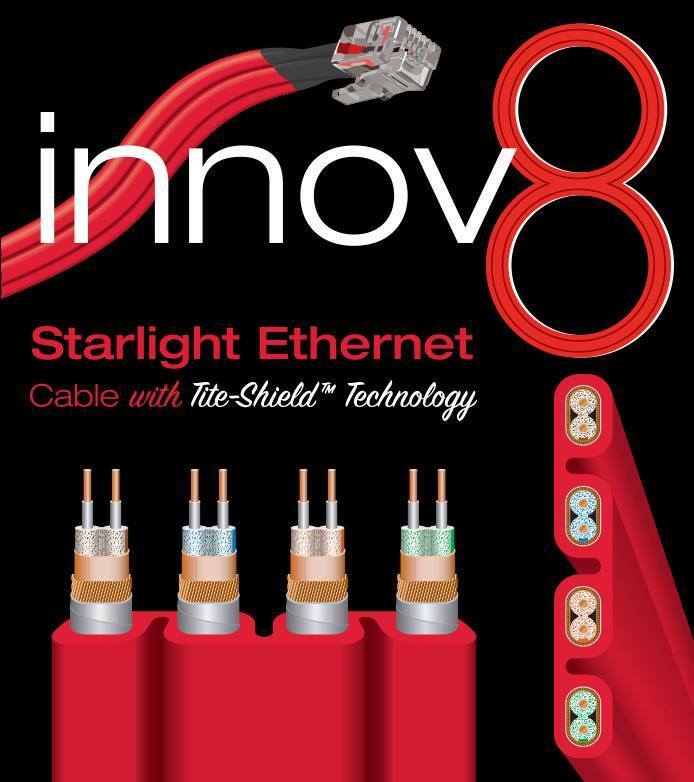 Starlight Ethernet is the first production cable that meets the proposed requirements for Category 8. This cable is also the first to incorporate Wireworld’s Tite-Shield Technology, a radical new structure that overcomes limitations of previous network cable designs. With twelve tightly spaced shields replacing the six unevenly spaced shields in Category 7 cables, the Tite-Shield design improves the most critical parameters of digital signal transmission. Starlight Ethernet sets new benchmarks for speed and fidelity in high-resolution media streaming applications. Category 7 cabling was created to satisfy the demands of 10 Gigabit Ethernet. Even though most media networks now run below that speed, cables that support higher speeds have been found to improve the quality of audio and video streaming. Those improvements are possible because streamed signals suffer from data errors that cannot be repaired by the error correction systems that preserve file transfers. The proposed standard for future networks is Category 8, which extends network speeds to the staggering rate of 40 gigabits per second. One of the reasons why CAT 7 cables do not meet the proposed CAT 8 specifications is that they allow too much crosstalk (mixing) between the four signal channels. To control crosstalk, conventional cables use four twisted pairs of conductors with one foil shield on each pair. An overall two-layer shield reduces outside interference. The problem with twisting is that it makes lengths of the conductors uneven, which causes timing errors called skew. Tite-Shield technology isolates the four channels with a three-layer shield on each conductor pair. Those shields are so effective that twisting is no longer needed and conductor length differences are eliminated. Starlight’s unique flat design provides greater separation between the four conductor pairs to provide lower crosstalk, supporting higher transmission speeds than conventional designs. The cable also utilizes Wireworld’s proprietary Composilex 2 insulation to minimize triboelectric noise. The refined transmission properties afforded by these technologies ensure uncompromised performance in the next generation ofstreaming applications.